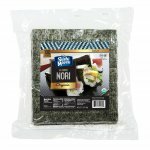 Sushi Maven Sriracha Chili Sauce 1 Gallon [SMSS] - $39.99 : SushiMaven.com, Your Source For Everything Sushi! Sushi Maven Sriracha Chili Sauce is a paste made of chili peppers, garlic, sugar and salt. Sriracha Sauce is a dipping sauce particularly for sushi and other seafood. It could also be used with Buffalo wings, pizza or french fries. Most commonly though, it is used to make an all time favorite spicy mayo! 1 gallon great for restaurant use!